If you are connected to the Internet, you can directly (re-)-request a new license or a license upgrade for your machine. After processing a license activation key will be sent to you which allows your to complete the licensing process. * The provided e-mail address is only used for the specified purpose and will not be stored or shared in any form. In case of a demo-license an administration key will be sent immediately to you. 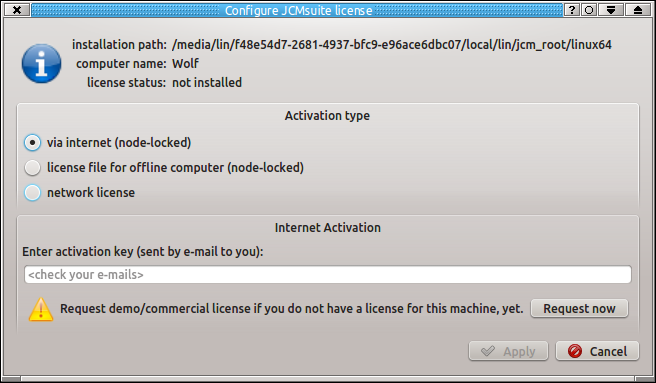 When requesting a commercial license JCMwave will contact you via e-mail to make an offer. Transfer the license file to the destination computer and install the license with the license configuration tool.